With the news that this Saturday will mark the end of Johnny Miller’s celebrated career as a TV analyst and announcer for NBC, I remember when he almost became a headliner for the West Michigan Golf Show which I owned and managed at the time. Here’s the story. After the success of the first West Michigan Golf Show in March, 1989, I rested up and began pondering what to do for the second annual edition. First, I reserved space at the Ford Fieldhouse in downtown Grand Rapids on the campus of GR Community College. Second, I mulled over headliners for the Show. The debut show had a strong collection of talent which featured National Long Driving Champion Big Cat Williams, PGA Teacher of the Year Mike Hebron from NY and celebrated teacher Hank Haney, known for his work with Mark O’Meara. I gulped at the amount but said, “Johnny, that’s fair, but give me a few more days to get back to you.” He readily agreed. After that conversation, I commiserated with my spouse and we listed the pros and cons of contracting with Miller as a headliner. The pros still outweighed the cons and I decided the money issue could be handled by adding some new sponsors to help with the costs. I hadn’t made any final sponsor proposals yet but I was confident about their prospects. The Golf Show was the new kid on the block and had attracted widespread attention. I waited for Miller to say yes and ask for more follow up details. Crestfallen, I thanked Miller for his kind consideration and being open originally to my invitation. So, in January 1990, Miller made his debut at the Bob Hope Classic in Palm Springs, In fact, he immediately gained a certain notoriety for describing a shot during a final round by Peter Jacobsen as “the kind of shot—a downhill lie over water—you can choke on.” Vintage Johnny. Miller said that Jacobsen didn’t speak to him for six months afterwards. Nowadays, they’re trusted colleagues and friends on the NBC golf team. 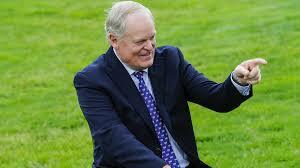 Anyway, that’s how Johnny Miller almost was a headliner for the West Michigan Golf Show. Oh yes, the headliners that year at the Golf Show were teacher Wally Armstrong and Muskegon native Jack Hamm, World Record holder for the longest drive at 437 yards. They were great guys and did a fine job on stage. But they weren’t Johnny Miller.